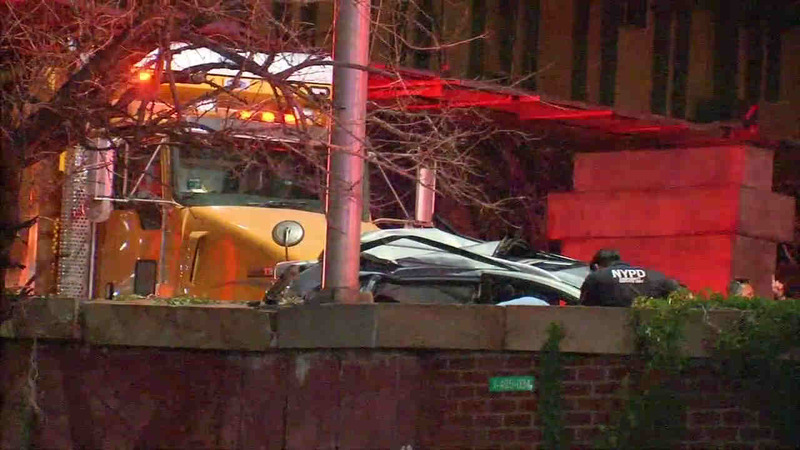 Darla Miles has an update on the accident on the LIE in Queens Wednesday that left 3 people dead. MASPETH, Queens (WABC) -- Three people were killed and 11 injured early Wednesday when an apparent high-speed, two-car crash triggered another collision of four more vehicles on the Long Island Expressway in Queens. The three victims were apparently thrown from a 2010 Infiniti into the lanes of traffic on the eastbound lower level, near the Maurice Avenue exit in Maspeth, in the initial crash just before 4:30 a.m.
Police say the car hit a highway divider, split in half and then struck another car. At least four more vehicles then collided in a secondary accident. The fatalities have been identified as 25-year-old Michael Fabre, of Oakland Gardens, who was the driver of the Infiniti; 24-year-old Giovanny Sanchez, of Brentwood; and 24-year-old Christina Formato, of Franklin Square, both passengers. Two others in the car were hurt, and one remains in critical condition while the other is stable. "We were looking for houses," Fabre's girlfriend, Bianca Sagliocca, said. "We were going to have a house. We were talking about kids. He wanted three. I wanted four." The couple of four years was planning their future, which was tragically cut short in the crash. "A few weeks ago, talked to my dad and asked if he could propose," she said. "So I'm sure that was coming up too." Fabre and Sanchez met in the National Guard, and both worked full time guard duty at JFK Airport and Penn Station. "They were inseparable, best friends," Sagliocca said. "They were almost like brothers." They worked second shift Tuesday night before heading to a birthday party in Hell's Kitchen, which they left around 4 a.m.
"We were all looking forward to this weekend," said Edwin Rodriguez, the uncle of one of the victims. "This Saturday was going to be a nice barbecue at her family's place. Now we have to do funeral arrangements. It just doesn't makes sense." Nine people in other vehicles -- including a yellow cab, a gray SUV, a black sedan and a silver car -- were injured, but they are expected to survive. They were rushed to Elmhurst Hospital and Queens Hospital Center in stable condition. A large yellow dump truck was also involved in the second crash, which witnesses say couldn't stop just as drivers were attempting to help the victims. "The dump truck came so fast, he just ran into everybody," witness Carlos Roche said. "Traffic basically was stopped, but he couldn't stop. And he ran into every car." Speed is being investigated as a possible cause of the initial collision, but the investigation is ongoing. Still, none of it makes sense to those the victims left behind. "I know he's with me," Sagliocca said. "He's always in my heart. I hope he's watching over me too."